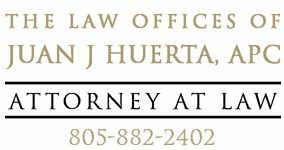 The Law Offices of Juan J. Huerta was established in Santa Barbara in 2005 and specializes in all areas of criminal defense and personal injury. Attorney Huerta has more than 20 years of legal experience in representing clients that have ranged from DUIs to serious felonies. As a former deputy public defender for the Los Angeles County Public Defender’s Office, Attorney Huerta has handled thousands of cases and numerous jury trials. He earned his law degree from Pepperdine University and is licensed to practice law in all courts in the State of California. Juan Huerta has secured millions of dollars for his personal injury clients. Allow us to obtain the maximum money for your injuries. Use the Contact Form on this page or call today for a free consultation. We serve both English and Spanish-speaking clients.